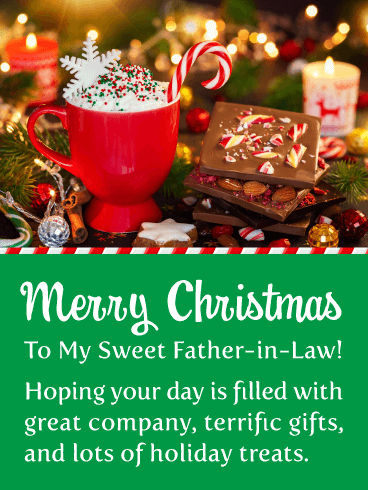 Does your father-in-law love sweets, if so, then he will really appreciate this fantastic Merry Christmas card. It showcases irresistible holiday candy and a perfect Christmas drink, complete with a traditional candy cane and sprinkles! 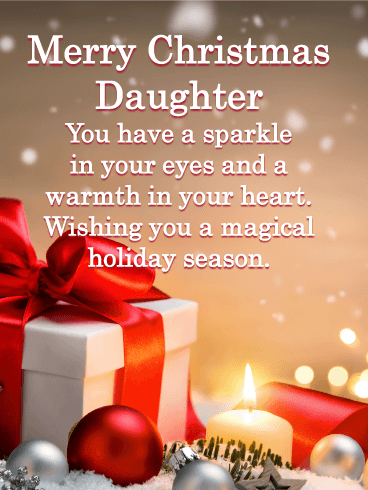 Your father-in-law will especially like that you think he is sweet and that you are sending him the very best. Put a smile on your father-in-law’s face this holiday season by getting this great Christmas card out to him now so he can enjoy it on this special day. Has Jack Frost visited your home and left frost-covered windows in his wake this winter? 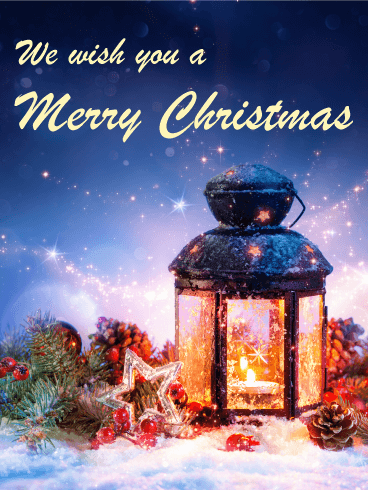 This Christmas Candle Lights card includes snow-frosted windows and evergreen branches in the background. Two stitched red ornaments, a star and a Christmas tree, hang by green clothespins above three lit candles. Pine cones and red ornaments are scattered along the windowsill in front of the candles. Use this Christmas card to say, "Merry Christmas" this year! How do you deck the halls for Christmas? 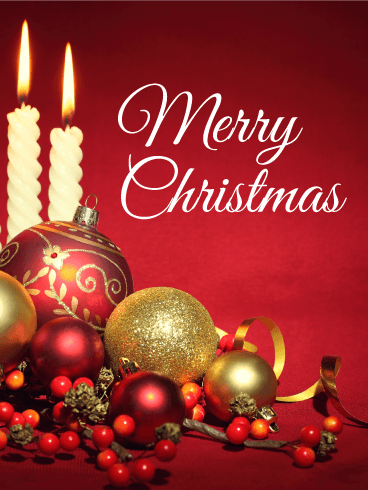 This Christmas card features classic Christmas candles, burning brightly as they rest on evergreen branches. Three red ornaments sit in front of the candles, two with elegant swirls of gold and one with small golden snowflakes. Swirls of white and gold frame the top and bottom of the Christmas card, with golden snowflakes and stars scattered throughout. Say "Merry Christmas" with this Christmas card today! Merry Christmas from all of us. Your loved ones will appreciate this warm holiday greeting. It features a lovely Christmas scene of pine cones, fir branches and holly berries. Let the falling snow bring tidings of comfort and joy this Christmas season. Just like the lantern is lit, so hope remains lit in our hearts to remind us that love is here for everyone. O holy night, the stars are brightly shining. 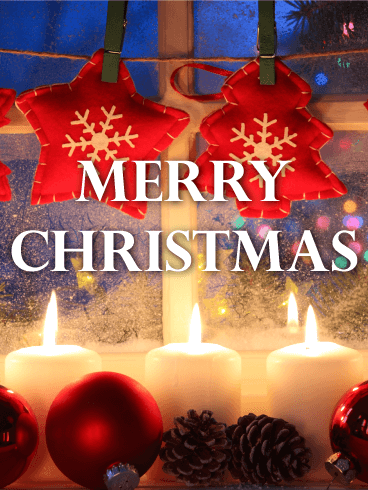 This quiet, reverent card is the perfect way to say "Merry Christmas" to the special people in your life. 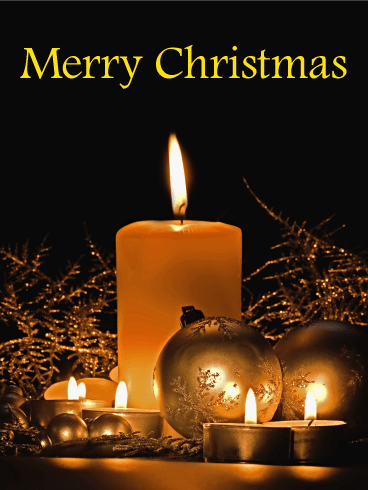 This Christmas card is warmed by the gentle glow of a large white candle and several small candles. They are joined by gold, snowflake-covered ornaments and golden branches, which gleam in the soft candlelight. 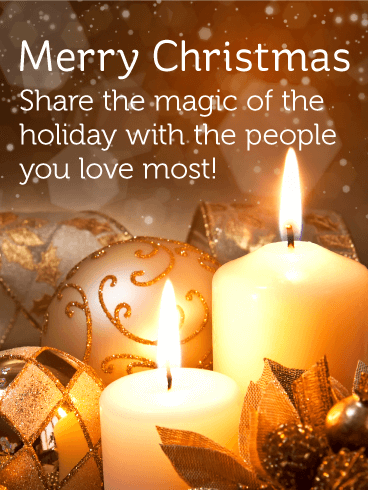 Christmas candles bring warmth and light to your holiday celebrations. 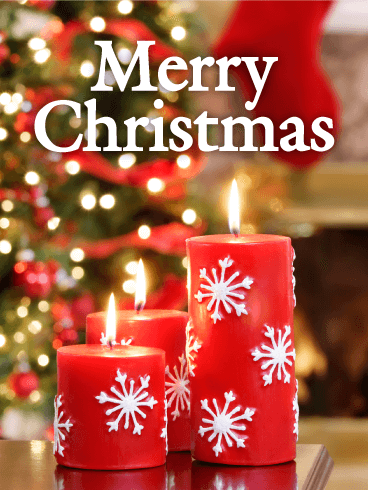 This red Christmas candle card features three red candles of varying sizes, each decorated with large white snowflakes. Behind them, a red stocking hangs above a warm fire and next to a large, brightly decorated Christmas tree. 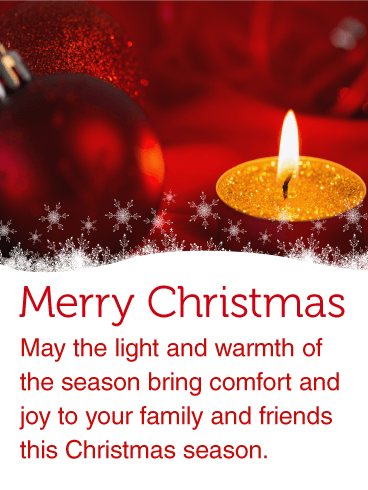 Bring warmth to your loved ones' Christmas celebrations and say "Merry Christmas" with this charming Christmas card. This Christmas decorations card features all the best parts of dressing your home for Christmas! 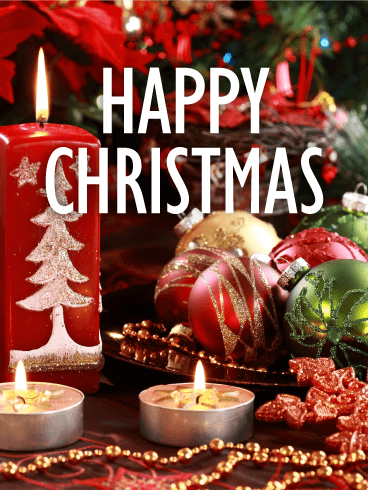 The colorful background is filled with bright poinsettias, garlands, ribbons, strings of gold beads, tall red candles with white Christmas tree designs, small candles, and red, gold, and green ornaments. 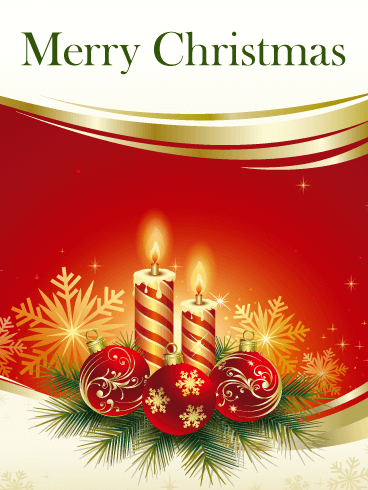 Use this Christmas card to remember the best of the holiday season and wish your loved ones a "Happy Christmas!"